Popeye the Sailor Man. Image available on the Internet and included in accordance with Title 17 U.S.C. Section 107. Popeye and Related Characters. Image available on the Internet and included in accordance with Title 17 U.S.C. Section 107. POPEYE. 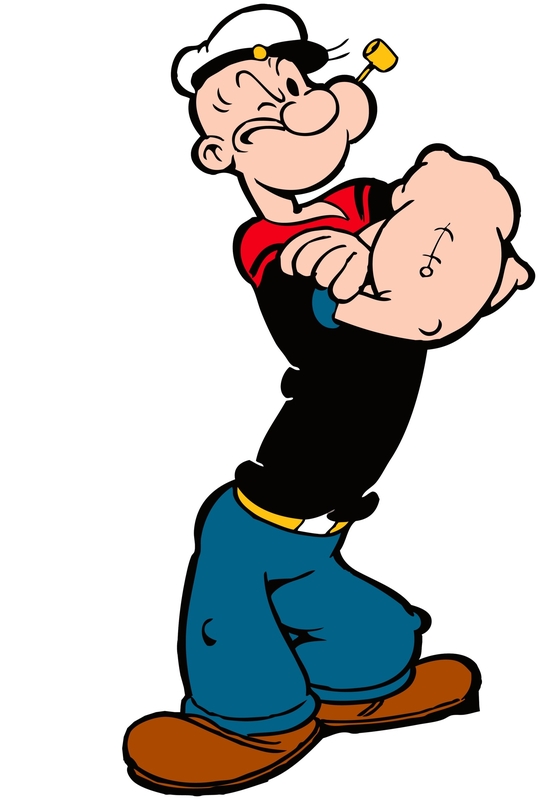 Popeye, the Sailor Man, renowned comic-strip character, is perhaps the most famous native son of Victoria, Texas. The Victoria Advocate was among the first newspapers in the nation to run Elzie Crisler Segar's comic strip, originally called "Thimble Theatre," which starred the spinach-eating hero. Segar (1894–1938) was born in Chester, Illinois, and worked as a moving-picture machine operator, a house painter, and a photographer before his first cartoon effort was rejected by a St. Louis paper. After taking an eighteen-month correspondence course in cartoon drawing he got a job on the Chicago Herald through the influence of "Buster Brown" cartoonist R. F. Outcault. Segar drew "Charlie Chaplin's Comic Capers" for two years, until the Herald went out of business; he then worked in 1917 for the Chicago Evening American, where he drew "Looping the Loop," a cartoon covering local events. Popeye appeared in Thimble Theatre on January 17, 1929. Image available on the Internet and included in accordance with Title 17 U.S.C. Section 107. In late 1919 the editor of the American sent some of Segar's drawings to the King Features Syndicate in New York; three weeks later Segar moved there, where, as he recalled, "I met `Popeye,' `Castor Oyl,' `Olive Oyle,' and the members of the cast of `Thimble Theater.'" 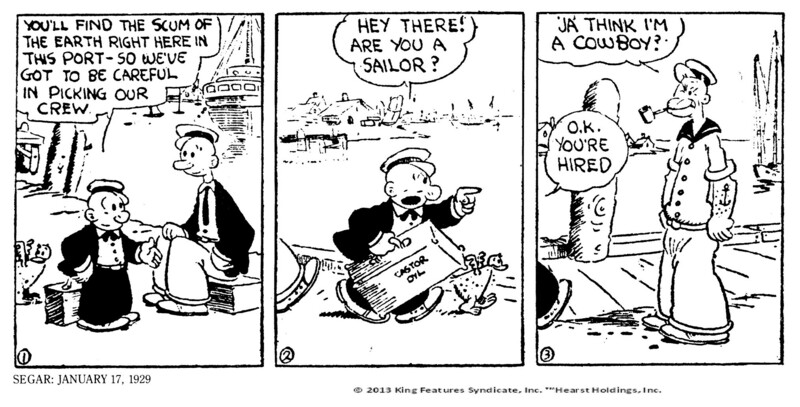 The salty sailor was not among the strip's original cast but appeared on January 17, 1929, when Segar was living in Santa Monica, California. The new character was probably inspired by Frank "Rocky" Feigle of Segar's hometown. By 1932 Popeye was the undisputed star of "Thimble Theatre," as evidenced in fan mail, toys, games, novelties, and jokes. 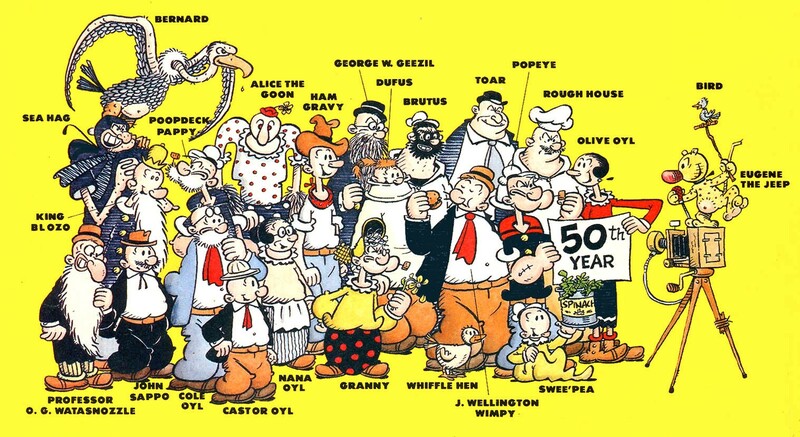 The comic strip's cast of characters grew to include Sea Hag, Professor O. G. Watasnozzle, Eugene the Jeep, Brutus, Alice the Goon, J. Wellington Wimpy, Swee'Pea, Granny, and Poopdeck Pappy. Popeye in the Victoria Advocate (1934). Courtesy of Michael Marks and Texas Standard. Image available on the Internet and included in accordance with Title 17 U.S.C. Section 107. 88th Anniversary of the Victoria Advocate, September 26, 1934. Courtesy of the Victoria Advocate. Image available on the Internet and included in accordance with Title 17 U.S.C. Section 107. 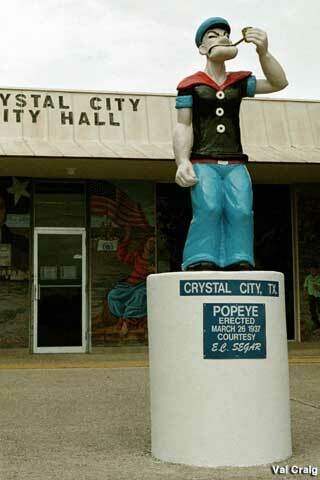 Segar himself called the Victoria Advocate Popeye's "hometown." In gratitude he contributed a special cartoon for the Advocate's historic 1934 anniversary issue. Speaking to the newspaper's editor through Popeye, Segar wrote, "Please assept me hearties bes' wishes an' felitcitations on account of yer paper's 88th Anniversity....Victoria is me ol' home town on account of tha's where I got born'd at." The Austin Dispatch wryly noted, in a story headed "President and Popeye Congratulate Texas Paper on Anniversary," that Popeye was among the more famous of the dignitaries to offer their congratulations, others including President Franklin D. Roosevelt, Vice President John Nance Garner, Governor Miriam Amanda Ferguson and former governor James Edward Ferguson, and Texas senators Thomas T. Connally and John Morris Sheppard. The cartoon series was animated in 1932 under the direction of Max Fleischer, and Sammy Lerner composed the words and music to the theme song, "I'm Popeye the Sailor Man." After Segar's death the newspaper series "Thimble Theatre" was written by Tom Sims, then Ralph Stein; the artwork was drawn by Doc Winner, then Bill Zaboly. Joe Musial and Bud Sagendorf later produced the series, and Sagendorf drew the comic-book version until George Wildman and Bill Pearson took over in the 1970s. The spinach industry credited Popeye and Segar with the 33 percent increase in spinach consumption from 1931 to 1936, and in 1937 Crystal City, Texas, the "Spinach Capital of the World," erected a statue to honor Segar and his sailor. Bud Sagendorf, Popeye: The First Fifty Years (New York: King Features, 1979). Victoria Advocate, 88th Anniversary Number, September 28, 1934. Handbook of Texas Online, Craig H. Roell, "POPEYE," accessed April 22, 2019, http://www.tshaonline.org/handbook/online/articles/lxp02.